Why Britain decided to leave the EU – but other countries haven’t - The Maghreb Times ! Why us? Why is the UK the first – and only – country to decide to leave the EU? Greenland, Algeria (when it was part of the French empire) and the French Caribbean island of St Barthélemy have all been in the EU and are no more, but the UK is the first full member country to hold a referendum and decide ‘enough’. Why us, and not one of the many other members nursing doubts about the EU? There are many reasons, none of which are to do with us being more inward looking or racist. We are an island, but arguably the most outward looking EU nation. We do have issues with racism, but various studies have concluded we are among the least racist countries in Europe. But being an island does mean we see ourselves apart from the rest of the EU in ways other members don’t (our sockets are different, we drive on the other side, and if there is fog in the Channel we think Europe is cut off). In contrast, being able to drive casually into a next door country does make you feel more intimately tied to them. We are by some margin the largest non-founding member (the three others of the ‘big four’ – Germany, France, Italy – were all founders.) As a non-founder we have never really felt it is ‘our’ project; as a large country we have the confidence to divorce in the way a smaller country wouldn’t. But there are also fundamental differences in national psychology that have fuelled Euroscepticism here. We have a triumphalist mentality fuelled by our history of world wars and empire (and evident in our football hooligans). We are the only EU member that sees the Second World War as a moment of national triumph, which is because we are the only EU member that actually won the Second World War (with the USSR and USA, and other non-EU allies). All other EU members were neutral, occupied or defeated, and see it primarily as a time of tragedy, shame and sorrow. That means that arguments that we need the EU to stop war happening again don’t resonate with the public here in the way they do in mainland EU (especially in the older generations). In mainland Europe, you keep bumping into sites of major battles, making the world wars feel ever present. We are just about the only EU member that has not had experience of dictatorship in living memory (Sweden is the other major exception). In Germany, Italy, France, Spain, Poland, Hungary, Greece, Portugal, Belgium, the Netherlands, Denmark, Lithuania and so on, the older generations remember what it is like to live under a dictatorship – sometimes into the 1970s and 80s – where the government really is the enemy. That is not true in the UK. That leads to a far more fundamental trust in our own government and institutions than in almost all other EU countries. I know that might sound incredible with our politics in the doldrums, but we fundamentally expect and unashamedly demand our government works for us, in a way that is very rare in other EU countries, where the population are often astonishingly suspicious of their governments. In Italy, for example, people so distrust their successive national governments because of their incompetence and corruption that they have been generally happy to transfer power to Brussels as a way to raise standards. In the UK, Denmark and Sweden, popular belief in democracy is notably more fundamental than other EU members, quite simple because we have been practicing it continuously for so much longer (albeit interrupted by Nazi occupation in Denmark’s case). Finally, we are the only EU member with an alternative family we belong to. 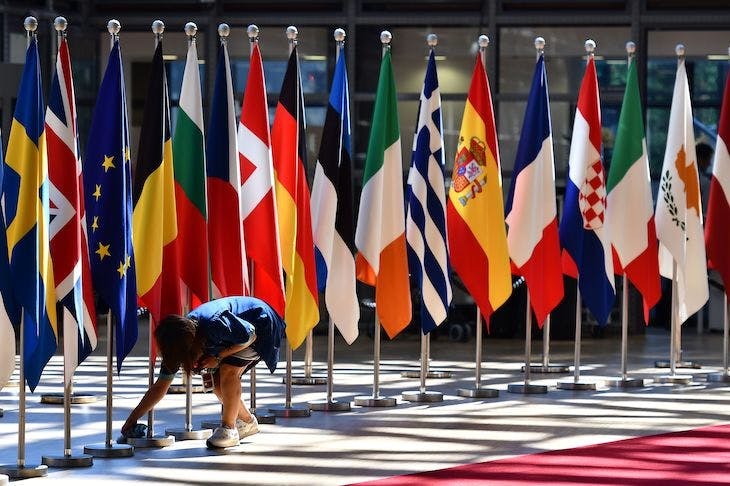 Living in Brussels, I was always impressed by how much other EU diplomats felt their countries had to hang together to protect themselves against the outside world. ‘It is all we have: each other,’ I remember one explaining. But as a country we also feel very close – indeed closer – to the US, Canada, Australia and New Zealand. It is not just at government level with agreements like the Five Eyes intelligence sharing regime and (except the US) a common head of state, but it is part of our culture, as a result of shared history and language. If you look at the statistics on where British people go to study, go on holiday, go to work, and who they marry, we are far closer to these other English speaking countries than any other EU country is. No other EU country has that alternative large and successful developed family (yes, Spain has much of Latin America, Portugal has Brazil, France has Quebec, the Netherlands has the Afrikaaners, but in no case is it a large family of peers; the Scandinavian countries are all very close, but three of them are already in the EU). A third of the global economy is countries we feel very close to who speak our language, and that makes us more secure as a country about striking out on our own. Leading Australian politicians have been notably vocal in urging us to leave the EU and come back to our family. None of this is an argument for Brexit, but it does help explain why Euroscepticism led to a referendum to leave the EU here, and not anywhere else. Anthony Browne is a former Europe editor of the Times.